Before I get into the details of this delightful dessert I want to remind everyone to start voting for your next Food Blog Star on Foodbuzz’s Project Food Blog. The voting started at 9:00 am EDT today and continues through Thursday, September 23, 2010, and the winners are announced on Friday, September 24, 2010. Of the original 1,890 contestants participating in round one which is known as “Ready, Set, Blog!”, only 400 get to advance to the next round of the competition. You can vote by clicking the link to Challenge #1: Ready, Set, Blog! 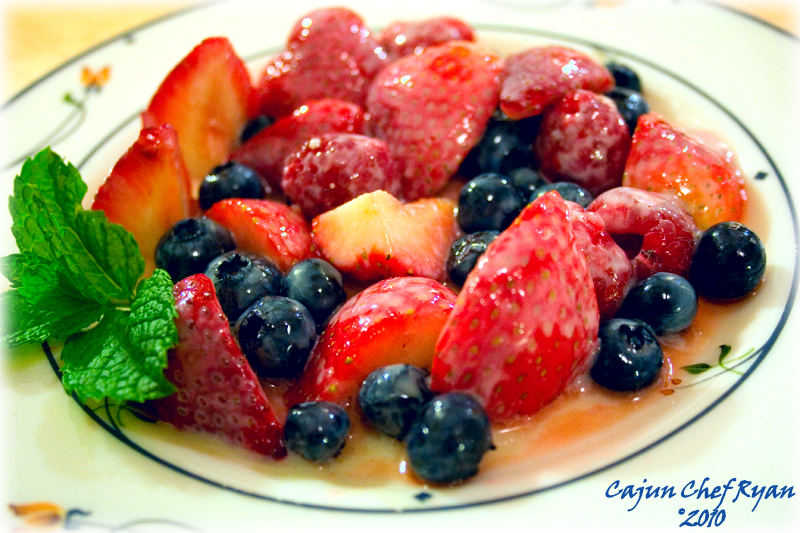 Fresh berries are one of the finest dessert ingredients you can find, and when lightly coated then gently tossed with a rum infusion and a bit of sugar, the fresh berries come alive and meld well with a classic Crème Anglaise dessert sauce. The Crème Anglaise is a classic French dessert sauce preparation, and if you learn only one dessert sauce you should perfect this one. It is a true masterpiece, and when executed perfectly makes any dessert even better. In its pure simplicity and with just five ingredients, this dessert sauce is to die for! 1. In a small stainless steel mixing bowl, gradually beat the sugar into the egg yolks and continue beating for 2 to 3 minutes until the mixture is pale yellow and forms a ribbon. 2. Beat in the starch into the yolk sugar mixture until dissolved. 3. While beating the yolk mixture, very gradually pour in the scalded milk in a thin steady stream, being sure that the yolks are not cooked or start to congeal. 4. Put the bowl over a double boiler or sauce pan containing a warm bath of simmering water. Using a rubber spatula or wooden spoon stir continuously reaching all over the bottom and sides of the bowl, until the sauce thickens just enough to coat the back of a spoon with a light, creamy sauce-like layer. Do not let the custard-like sauce come to simmer, it should never get over 170° F.
5. When the sauce is thickened to the proper consistency, remove from the heat and using a wire whisk beat the sauce for a minute or two to cool it. Strain it through a fine sieve into another bowl, and beat in the vanilla. 6. Set the bowl of sauce into a larger bowl of cold water, and stir frequently until cool. Then cover and chill. 1. In a small bowl combine the sugar and rum, stir well until sugar is dissolved. 2. Toss the berries in with the bowl of sweetened rum to coat well. 3. Arrange the berries on two serving dishes and then lightly drizzle them with the Crème Anglaise sauce, garnish with fresh mint leaves and serve immediately. Ooooooooh my! This is AMAZING. 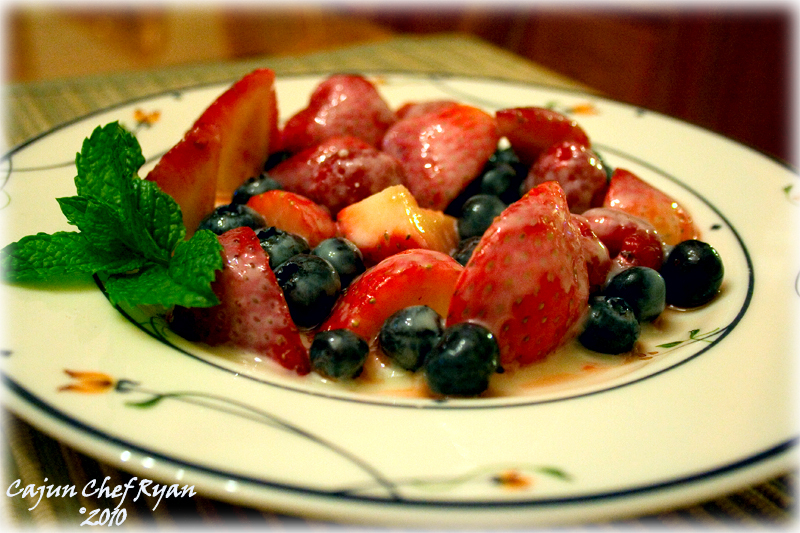 Thank you so much, and yes the berries without the added sugar and sauce are very healthy indeed! Beautiful! Simple and classic. This is the perfect dessert, especially when you are really full but still want something sweet. Great and wonderful looking dish! This dish looks amazing! Good luck in the FB contest, I’m going to vote for ya ASAP! Marisa, indeed, it is a great way to finish off a meal, yet not too terribly rich. Jason, thank you my BBQ man! Angie, thank you so much! I was certainly happy to share one of my votes with you. I fully expect to see you in the next round! I have no expectations what so ever about making it past the first level, and thank you so very much! 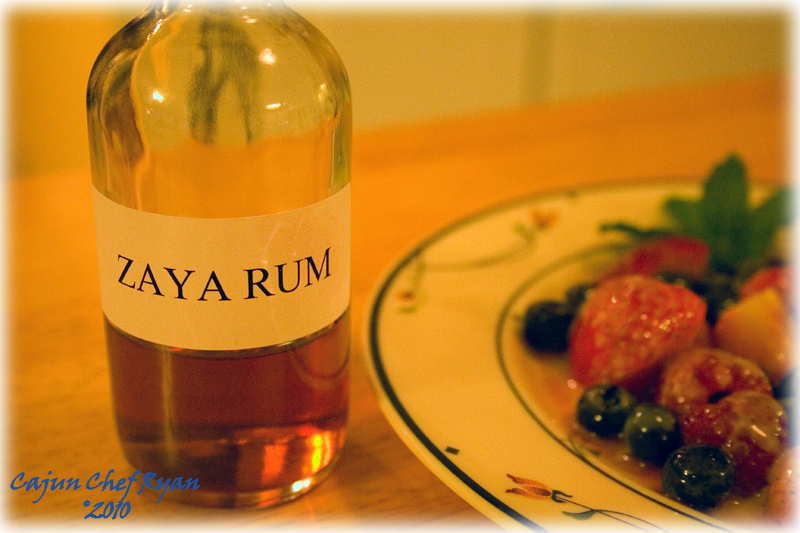 The berries are lovely, rum is a great addition! Voted for you! My vote for you is in as well! One of my favorite desserts. Can’t wait to try your version. Looks absolutely incredible! Berries and cream; what’s not to love. Oh, and alcohol. Be still my heart. Thank you for sharing this wonderful recipe. Good luck in the challenge! This is a beautiful and elegant dessert. Lovely photos as well Chef. BTW…I stopped by your PFB profile and dropped off a vote. Best of luck to you in the competition! If I could I would vote twice for you~ vote is in my friend!!! Berries and rum,sSimple and delicious -what more could you ask for! Cast my vote! Good luck, Chef Ryan.